The need for quality healthcare is becoming more and more important pressing. 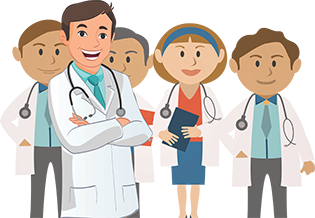 Just as important is the need for medical establishments that specialise in different branches of the medical field, thus giving personalised attention from specialists with years of experience. Apollo Clinic is run by Apollo Health & Lifestyle Limited (AHLL) and was created to fulfil all of these requirements. Upholding the promise of bringing international standards of healthcare to our patients, Apollo Clinic runs a network of over 61 clinics in India. Cardiology - Holistic care and treatment for all disorders relating to the cardiovascular system. Internal Medicine - Focused service and medical care for the prevention, diagnosis and treatment of adult diseases. Gynaecology - Care and treatment of disorders and conditions specific to women and girls. Paediatrics - Focused on medical assistance and treatment for infants, children and adolescents. Urology - Specialised care and treatment for disorders pertaining to the human urinary track system and reproductive organs. Orthopaedics - Specialized care and treatment for all conditions and disorders related to the musculoskeletal system. Neurology - Focuses on treatment and care of all disorders of the body’s nervous system. Dermatology - Focus on the care and treatment of disorders relating to the skin, nails and hair. Gastroenterology - Holistic care and treatment for all disorders of the stomach and intestines. Dentistry - Specialised care and treatment of all issues associated with the oral cavity. Pulmonology - Focused on care and treatment for all disorders pertaining to the respiratory tract. Endocrinology - Specialised care and treatment for all diseases relating to the endocrine glands and hormones. ENT - Specialities dedicated towards the care and treatment for all disorder pertaining to the ear, nose or the throat. Ophthalmology - Specialised care and treatment to diagnose and treat all eye diseases, ranging from glasses and contact lenses to eye surgery.